What are you specifically looking for? Those are PC only mods from what my son just told me. You can easily download custom maps and add them to your Xbox using Horizon. Although the maps are not in the Horizon program they are easy to get. http://mcdn360.com/ is a great site with new maps added daily. Youtube is also a great place to find them, just search for Minecraft Xbox map download or be more specific and you’ll find tons, look for the download link under the video by clicking the show more option. Sometimes the downloaded map will come in a .rar or .zip container and you’ll need to extract/remove it from that container before it can be added to your USB drive with Horizon, just open it and drag the single file you find inside the container out to your desktop or directly into the gray open area of Horizon. Here’s some additional instructions:[details=Open Me] Open one of your own saves in Horizon and then drag in the Minecraft save/map along side it, now copy and paste the 3 ID’s from your save over to the Minecraft one, now choose to “Save Rehash and Resign” twice to be safe and now choose to “Save to Device” in the upper right hand corner of the Minecraft save and it will be saved to your device. Now you can stick your USB drive back into your 360 and either move the save to your hard drive or just keep it on the flash drive and play it from there. Read the above replies and use google. I have never seen any xbox 360 equivalent for minecraft pc mods. And even if you would find it, your xbox 360 wont allow it. You can edit vanilla saves but that’s where retail modding begins and ends for xbox 360 minecraft. If you want minecraft mods, just purchase the pc version. It will run well enough on ****ty computers. I don’t know how to download horizon if someone could tell me in the next 5 min that would be so great srry about the username tho my was lost so I half to use my lil bro’s and he is very immature. After that right click on the installer and run as admin. If you have any problems installing, please, make your own thread instead of hijacking. Hello! I have watched several videos on how to get custom maps downloaded a d transfered to the xbox 360 via a flash drive using horizon. The problem I am having is when I insert the file to the gamer profile in horizon, the map still connects to “unknown profile” rather than the gamer profile I inserted it to. This makes it so we can’t use the map. Is anyone able to help me with this? how do i add a mod to an existing save? No. 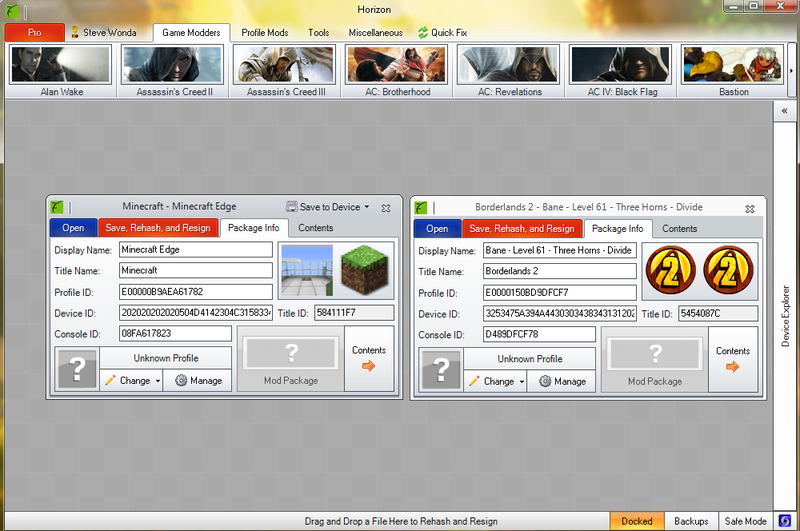 You cannot add mods to Xbox 360 minecraft.